A demanding boss, family issues, academic pressure, illness, financial woes, relationship problems -- all of these can boost your everyday stress levels. People react to stress in different ways, but many undergo a shift in eating patterns. It’s common to turn to food for comfort, but that often leads to overeating and weight gain. For others, high levels of stress might make food unappealing, causing weight loss. It’s more likely you’ll gain weight than lose it when you’re stressed, given the simple mechanics of the body’s system for handling stressful situations. Stress puts your natural fight-or-flight response into gear, prompting you to produce more cortisol, the hormone that helps your body meet its increased energy demands. This boost in cortisol has a direct link to fat storage and weight gain, especially through the belly. People with excessive abdominal fat are at higher risk for cardiovascular disease and Type 2 diabetes. When you’re under stress, you’re likely to overindulge in cookies, candy and other high-calorie foods that seem soothing. In one study, published in “Nutrition” in 2013, students under stress to perform well in high school ate more food overall than those who were not academically stressed, and they also chose a high amount of sugary foods. A study of healthy adults, published in “Psychosomatic Medicine” in 2000, similarly found that stress increased emotional eating, with participants under stress reaching most often for high-fat, high-sugar, calorie-dense foods. Stressful situations might also lead to weight loss, especially if you’re grieving or going through a traumatic event. If you develop anxiety about your level of stress or become depressed, it may diminish your desire to eat or make food seem unappealing. You start to shed pounds when you aren’t getting the calories you need to maintain your regular weight. Anxiety can also lead to nervous, fidgety movement or excessive exercise, so that you burn more calories than you take in and lose weight. Talk to your doctor if you have suddenly started to lose weight. Making poor food choices or not eating enough can compromise your immune system and leave you vulnerable to disease. Make sure you eat a mix of fresh fruits and vegetables, whole grains, lean protein and healthy fats. On days when you don’t have much of an appetite, try eating smaller portions throughout the day instead of large amounts of food at a few sittings. Practicing yoga or meditation, listening to music and staying social are all stress-management techniques that may help you through the rough patches. Why Does Anxiety Cause Weight Loss? 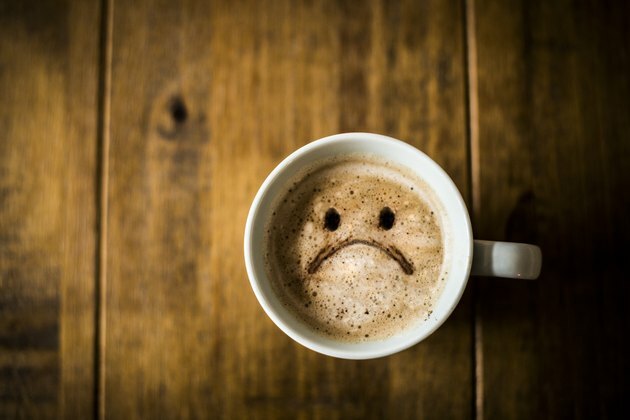 Do Caffeine Crashes Make You Depressed?